“Play what it is, not what it isn’t,” is something Martin Katz said to me in a lesson. This, along with many other intuitive insights of his, transformed my playing dramatically. We all bring our past along with us to rehearsals, lessons, coachings, and performances. That may be unavoidable. However, we can overcome many things that block our progress. This particular lesson included the song “Du Bist Die Ruh,” by Franz Schubert. Although it is only 2 pages, it is not easy for singers or pianists. Both performers must be very quiet. After all, the poem is about peace and love. Also, when you sing the 2nd page (yes, you, even if your are a pianist! ), you will find some spots where you might run out of breath unless everything goes perfectly. The singer’s part must be addressed by the pianist, of course. 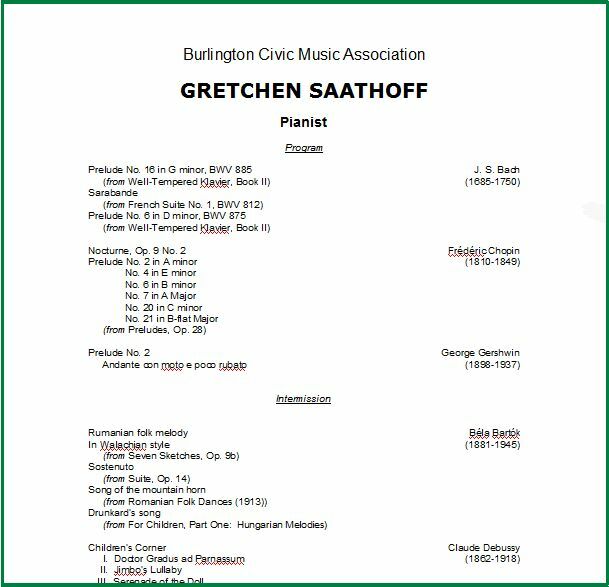 Getting the 2nd page to be in sync is a big challenge, due to the singer’s potential need to change her/his breathing plan because of the demands of quiet singing, the ascending line with a diminuendo, and the fermata (also on a quiet note!). And some words begin with a vowel, making the pianist’s task of “catching” the singer more difficult. Listen: Kathleen Ferrier sings "Du Bist Die Ruh"
Soon I was able to let go of “Don’t play too loud!” “Careful!” “You’ll be late!” and other panic-based, unhelpful messages to myself. Recently I have been working on this idea with a student who was an adult beginner just a few years ago. She has made impressive progress during that time, but still gets in her own way occasionally. Adult beginners tend to have a lot of angst about playing. They feel they’re behind, have to learn as an adult what kids learned without thinking, that printed music is hard to read, and the list goes on from there. My approach is to ask my student questions. The answers that follow give me an idea about how she is thinking. Usually, she needs to be more specific. Also, last week I found that a general panic was still lurking just beneath its former up-front status, resulting in a lack of focus. The panic is about the huge potential for playing wrong notes. So then the tension escalates, wrong notes occur more and more often as the piece proceeds (reinforcing the fear, giving it validity), and focusing on the playing at today’s level is almost impossible. Suggestions welcome! How do you handle your fear about learning and performing music? How do you work with your students to help them minimize their fears? How do you go about choosing a program? There are so many possibilities: various types of concerts to be presented; far too much repertoire to perform in one program; a wide variety of audiences you will be performing to, for starters. Here are several I’ve thought of. Identifying specifics helps make your path to finalizing a program as clear as possible. Lecture ~ the songs of Alban Berg, if they are the entire program, would require some explanatory speaking as well. Or you could introduce new works in this way. The first type would include music of several periods, and would be in chronological order, more or less. A singer’s program would feature at least 3 or 4 languages. Be aware that a themed program could become tedious ~ how many Spring songs would you want to hear in one concert? I’d say 1/2 a program, at most, or perhaps one group. Your theme can encompass a broader spectrum (add Summer!). Chronological order is often not required. The length of the program is an important factor. If it’s a 1/2 hr. lunchtime concert, how many groups will you have time for? Are you planning to play one sonata? Several shorter pieces? What is your audience? Considering this will certainly guide your choices. A reliable way to find this information is by speaking to the music director of the series. You would also be wise to look at the website for the concert series. Programs from other concerts are often posted, or, if not, composers may be listed. And if the performers’ websites are listed, you can learn a great deal by visiting them, too. In all cases, show your strengths. No one performs everything. So program the composers you feel most comfortable with, the songs and arias that fit your voice, the styles you excel in. Talk to audience members after you perform. Find out what they liked best, what they noticed, and other aspects of their experience. Feedback can be quite helpful for the next time. Last night I had a wonderful page turner! If that were always the case, this post probably would not exist. I also have a list or two. Jacksonville, FL ~ a society type, probably a board member, wearing a ton of perfume. She turned well, but I couldn’t breathe! The page turner who talked during the music. How can you gauge balance when there is constant interference with the sound? Somewhere in MN ~ the high school senior who was very nervous. He turned relatively well, but when he wasn’t busy, cracked his knuckles out of rhythm. I decided to try ignoring it rather than calling it to his attention. Making him even more nervous would have been a disaster. The engineering major at Yale who turned for a Met Regional competition ~ he didn’t read music, and was pretty terrible. The nervous page turner who panics and turns too early. The basket case whose hands are shaking, so the pages shake too! A 14-year-old who was studying piano and clarinet, remained calm, watched for cues, followed instructions, and turned perfectly. Last night’s page turner, who plays the piano and sings in the Boston Symphony Chorus. Perfection! During the summer when I was a student at the Aspen Music Festival, the Juilliard Quartet had open rehearsals. One such rehearsal included a quartet by Elliott Carter, for which the Juilliard played the premiere. Playing from open score in manuscript, each player had marked in his score his designated page turns for the other players! Each player then stood many times, crossed over to another player’s stand, turned the page, and returned to playing his part. I once turned for an organist who had four different ways he wanted his pages turned! I listened politely to the system, then turned the way I normally do. Along the way, I had to sing the violin solo for variations by Tartini many times so he could do the performance! Turning for piano 4-hands is especially difficult. When there is one score, and the page turner is located between the performers, the score is hard to reach. In addition, how many pages can you watch at once? Sometimes the page you’re watching ends in several bars rest, while the opposite page is busy with 16th notes. Many more chances to turn randomly. How do you go into a performance involving page turns? Is the score in good condition? It needs to lie flat, be stable (if the staples have come out, repair it), and have repeats, cuts, etc. clearly marked. Unless you are making a recording (removing loose pages from the music rack is soundless), make a book or copy/tape pages together back to back. Expecting a page turner to keep loose pages from falling on to the floor or flying out into the audience is really too much. Do you meet with the page turner before the concert? It’s much safer that way. You can point out repeats and cuts. I always ask if s/he would like to write something in the margin as a reminder. If written reminders are in her/his own words/handwriting, it’s more likely they will be successful. It’s OK to remind the page turner of a specific repeat or cut just before a particular piece is performed during the concert. Often, you can just point to the spot in question, or whisper a couple of words. When you are aware of your preferences, the whole experience will go more smoothly. Don’t make a page turner guess all the time. When do you want the page turned? Before you reach the end of the page? After? Just as you get there? Do you want it turned from the top or the bottom? Right or left side? Page turner standing or not? When the page turner is relatively tall (over 5’6″, say), I usually ask them to be on the left. Shorter people can reach the score more easily from the right. The stage setup is important, too. Make sure you can see what you need to: soloists, conductor, music. Sometimes the piano will be on short stick toward a chorus, on the “wrong” side of the stage. You might want the page turner to be on the side away from the audience. This is what I prefer. Maybe this will help you think about how you want to handle these situations. An arrival time of 1/2 hour before the concert seems to work well. The page turn heads up can be relatively relaxed, and there are usually last-minute things going on. You don’t want to be in a tense place during this time. I ask the page turner to use a chair, most often to my left, and stand shortly before the page is turned. A few bars before is plenty. When they stand is relative to the tempo. Turn from the top, arm above the score. Turning from the bottom causes the page turner’s arm to block my view of the keyboard. Use the hand that isn’t turning to hold fabric of a jacket or dress, jewelry, etc., out of the way. Stand clear of the keyboard so I can get to the lowest notes w/my entire body. If I feel cramped for space, I’ll either run into someone or miss notes. If you get lost, don’t panic! Llook directly at me, and I’ll give you a cue. Then I demonstrate how I’ll nod my head, so there is no confusion. “You were so good, it was like you weren’t even there!” There you go. For a page turner, that’s a compliment! It is preferable to turn one’s own pages, of course. This is entirely possible when playing for voice recitals. In other situations, it is often not. 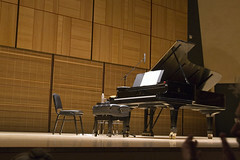 The pianist Christopher O’Reilly uses the Air Turn system. It looks wonderful. I haven’t gone there yet, personally.